Joe Louis and Tony Galento appeared together on The Way It Was, a sports nostalgia program (PBS), on January 29, 1976. The episode was lively, due almost exclusively to Galento's still-direct and colorful style of engagement. Louis showed a surprising side of himself when, after fending off a question by veteran fight commentator Don Dunphy, regarding any ill feeling vs. Max Schmeling (Louis stating he and Schmeling had not truly been adversaries but indeed "good friends"), he then pointed at Galento and stated, "But that little fellow...he really got me mad. All those mean things he said about me while training for our fight. He got me mad, all right." Louis furthered this statement by revealing that his anger by fight time was such that he had decided to "carry" Galento, i.e. to drag the fight out in order to "punish him for those nasty things". After suffering the knockdown, however, Louis changed his mind: "[Galento] hit too hard. So I knocked him out as quickly as I could." Less known, possibly with good reason, is Galento's battle with Ernie Schaaf in 1932 (Newark). Schaaf was at the time ranked No. 3 by Ring Magazine, and the fight was considered a stepping stone to a title fight with then-champion Jack Sharkey. The fight seemed jinxed from the first, however, rained out three times before finally taking place. It went the scheduled 10-round distance, but was a seesaw affair, rife with brutal infighting and containing many illegal blows. Two-Ton Tony repeatedly struck Schaaf behind the neck with right hand chops ('rabbit punches'). Schaaf, who recovered quickly, was stronger at the end and won the decision, but did not leave his dressing room table for long hours, while Galento merely collected his purse and went home. Schaaf's career spiraled down, culminating in a harrowing beating from Max Baer, followed by his death from light blows early in his final fight, vs. Primo Carnera. 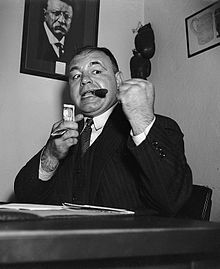 Fight lore has long held Baer's devastating right hand responsible for the ring death of Schaaf, but in the hardline culture of the 1930s, Newark sportswriters were quick to claim Galento and the above battle-royal as having done the telling damage. Galento retired from boxing in 1943, and applied his talents to the world of professional wrestling. He also turned to acting, and was given roles in Wind Across The Everglades (1958), The Best Things in Life Are Free (1956), Guys and Dolls (1955) and On the Waterfront (1954). He retained a kind of "folk hero" status, and was profiled several times, once by W.C. Heinz in TRUE Magazine (AUGUST, 1960; VOL. 41, NO. 279). Galento was interred in St. Johns Catholic Cemetery in Orange, New Jersey. ^ McLemore, Henry (March 14, 1939). "Beer Barrel Buddha". LOOK. 3 (6). ^ Miller, Margery (1945). Joe Louis: American (pre-ISBN First ed.). New York, NY: Current Books, Inc./A.A. Wyn. p. 115. ^ Fried, Ronald K. (1991). Corner Men (First Edition, 1st Printing ed.). New York, NY: Four Walls Eight Windows. pp. 210–211. ISBN 0-941423-48-4. ^ Dunphy, Don (1988). Don Dunphy At Ringside. New York: Henry Holt And Company. pp. 289 (includes Index). ISBN 0-8050-0530-7. ^ Donovan, Joseph (1939). Galento the Great. New York: George Winn. pp. 118 (plus ring record). ^ Heinz, W.C. (August 1960). "The Curious Career of the Primeval Pugilist". TRUE. 41 (279). ^ Tony "Two-Ton" Galento, Find A Grave. Accessed August 23, 2007. This page is based on the Wikipedia article Tony Galento; it is used under the Creative Commons Attribution-ShareAlike 3.0 Unported License (CC-BY-SA). You may redistribute it, verbatim or modified, providing that you comply with the terms of the CC-BY-SA.